The Northern Lights (Aurora Borealis) and the Southern Lights (Aurora Australis) are caused by the solar wind colliding with atoms and ions in the earth's atmosphere. 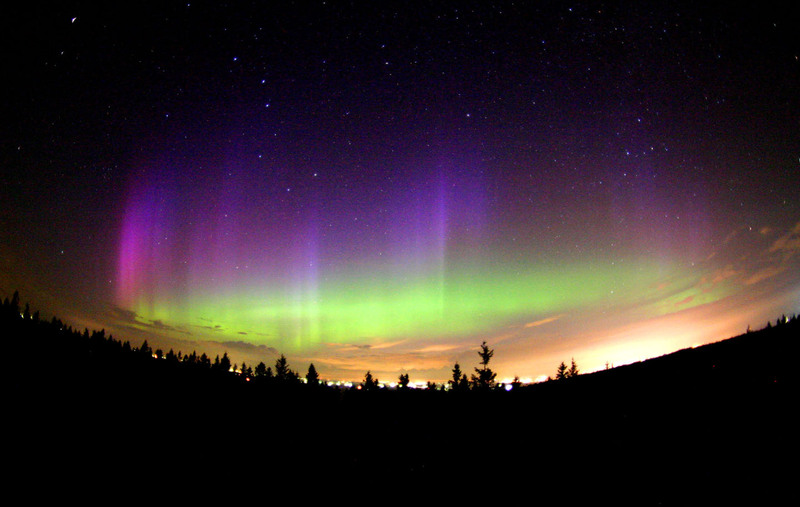 The color of the aurora depends on the proportion of oxygen to nitrogen which, in turn, depends on the altitude of aurora activity. Between 120-180 kilometers, the color produced is green; red, at altitudes greater than 180 km; blue and violet, below 120 km. 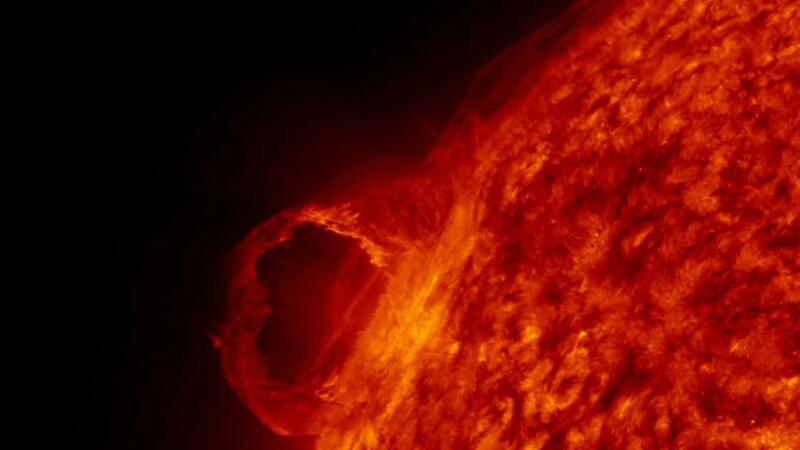 With 'solar storms', red can occur at altitudes as low as 90 km. 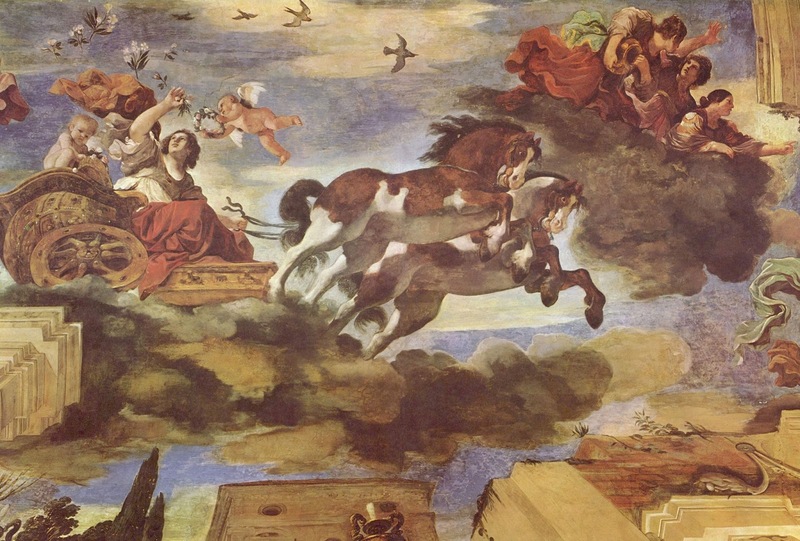 In Roman mythology, Aurora was the goddess of the dawn. She had 2 siblings: a brother, Sol (the sun) and a sister, Luna (the moon). 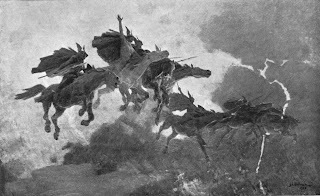 In the early morning, Aurora would cross the sky, announcing the arrival of the sun. The Romans also saw the lights as coming from celestial caves (chasmata). Aristotle (Greek) thought the aurora came from fire sources on earth. The appearance of an aurora could inspire positive and negative reaction or be seen as a precursor of favorable (royal births) or unfavorable (war, famine) events. Scandinavian belief linked the aurora to dead virgins; the Finns felt the lights were reflections from the shields of the 'Valkyries', the war-like women who guided dead warriors to Valhalla. Australian aborigines saw the Southern Lights as the 'dancing of the gods'. The Algonquin of native North America, saw the lights as the fires of the creator, Nanahbozho. From the Book of Ezekiel 1:4, "a whirlwind came out of the north, a great cloud, and a fire in folding itself, and a brightness was about it, and out of the midst thereof as the color of amber, out of the midst of the fire". Up until the18th century, people saw Northern Lights as being related to the concept of heaven and hell. Even during the Klondike Gold Rush (1898), the Northern Lights were said to reflect a great Mother Lode of gold. The Inuit of the Arctic have stories and traditions concerning the lights in the sky. The Northern lights are a phenomenon that these people have lived with for thousands of years and, like many people, they respected and revered the aurora. One tradition cautions people not to whistle at the lights as this would bring them closer, would cut off their heads and carry them off up into the sky. Another story explains that the spirits of the dead go to the Northern Lights where they spend eternity playing games, kicking a walrus head as we would a football. A regular aurora can be beautiful. An aurora from a solar storm can be destructive. But 'Fire in the Sky' associated with a 'coronal mass ejection' (CME) can be deadly.